A chapter by chapter look at the Gospel of St Matthew. Complete with study questions and contemporary discussions. We will tour through Matthew’s gospel. You will witness the life of Jesus as God quietly worked through history. You can witness Jesus birth and early life. You will see God intervene to protect the newborn and helpless Jesus. You’ll hear John the Baptist call each one of us back to God. You’ll see Jesus call his disciples and walk throughout Israel healing the sick, giving the blind sight, making the deaf hear and making the mute speak. We’ve seen him feed thousands. You’ll watch him take on the religious leaders of his day, calling them false prophets and hypocrites. Then you will be a first-hand witness as Jesus slowly walk towards Calvary. You can witness his crucifixion, death, and burial. Finally, you will learn about his rise from the dead, and the mission he gave his church. You can hear about the greatest message from the greatest messenger. The word of God is where we can hear God speak to each one of us. The Bible is where all of us can meet with Jesus himself hearing the voice of our loving creator. Come to join the study of God’s Word. 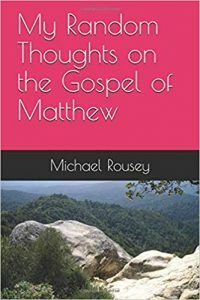 For better or worse what you have here are my random thoughts that I’ve journaled as I read the Gospel of Matthew. These aren’t theological or meant to favor any one individual denomination or movement. It’s simply my thoughts as I have read. My hope is that as you follow along you’ll open your Bible and write down your thoughts as the Holy Spirit fills your mind and hearts. Here we go. For many different reasons, four different men wrote the individual Gospels. Each one had different audiences and came from different points of view. The book of Matthew begins our trip through the new testament. While Matthew is the first book of the new testament, historically, it is believed that Matthew was the third gospel that written. Tradition has viewed Matthew the tax collector, who Jesus called in Matthew 9 verse 9, Mark 2 verse 14, and Luke 6 verse 15, as the author of this Gospel. Matthew was the tax collector who Jesus called while sitting on the side of a road collecting taxes for the hated Romans. Matthew wrote his gospel to his Jewish contemporaries. As we will discuss later, due to his vocation, Matthew would likely have been the person voted least likely to write a Gospel to the Jewish people. In spite of this, that is who Matthew wrote his Gospel to. He spends much of his gospel showing and proving Jesus fulfilled the old testament prophecies. Matthew wrote his Gospel sometime between 70 and 80 BC. He reaches out to his Jewish-Christian brothers and sisters, many of whom are being persecuted and attacked by the Jewish leadership of their day. They are being called heretics, shunned by friends, family and the church. Many have expelled from the synagogues. Some of the Jewish-Christians have suffered physical attacks, and some of them are in danger of being killed. Matthew reaches back into the old testament and shows them that Jesus fulfilled every prophecy. He uses the old testament scriptures and shows them how they point directly to Jesus being the long-foretold Messiah. He showed them that they were not worshipping in vain. Matthew was also reaching out to the Jewish people in hopes that he could share Jesus with them. Those Israelites who had refused to believe that Jesus was who he said he was. He wanted them to understand that Jesus was the Messiah. Not the Messiah to save them from the Romans. Not the Messiah who was to build a new Jewish nation. Not the ruler of an earthly kingdom. Instead, Jesus was the savior from sin and death. The savior who would open a doorway for every single one of us to enter into heaven. He was the savior that we needed and the savior that we still need to this day.